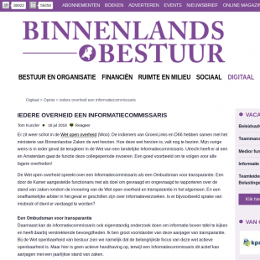 Tom Kunzler, interim director of the Open State Foundation, writes a plea for the implementation of the Dutch concept of an information commissioner (informatiecommissaris). An information commissioner is someone who evaluates the current status of the law on open governance and transparency (Wet open overheid en transparentie). The individual is also an independent arbitrator when disputes on information requests arise. Currently, only the municpality of Utrecht has an information commissioner and Amsterdam plans to install one in the near future, but that is of course not enough. Tom Kunzler hopes that more government levels will install an information commissioner as that will strengthen the transparency and open data policies of the government. Click here to read his Dutch column in Binnenlands Bestuur.